DeeKay and Bwana Rob are SOAS students with a passion for radio, and Swahili too! They are proud to present the first Swahili language show to be broadcast on SOAS Radio. 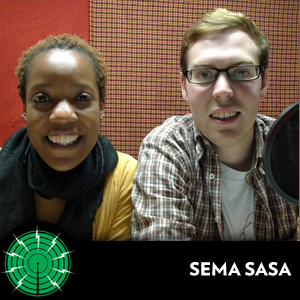 Sema Sasa is an up-beat show bringing you the best of Swahili Hip-Hop and topical chat. Bwana Rob is dedicated to hunting down the best Swahili Hip-Hop artists, both new and old, and bringing them to the UK airwaves for everyone to enjoy. DebeKay knows how to get people talking, and each week she will be bringing in special guests to generate lively debate about the latest issues in East Africa and the UK. Hopefully the show can reach out to Swahili speakers and Swahili students, providing a new medium for Swahili on the airwaves! African Development Forum (ADF) have been running for two years now and the this years forum was graced by an array of guests from different fields, all working in development in Africa. Listen to David Muller, one of its members, speak about this years theme and who are the speakers for this forum. In this special feature we chat with KBC, one of the founding members of the legendary Swahili Hip Hop crew, Kwanza Unit. Listen in to find out more about the history of Swahili Hip Hop and where its headed in the next few years. This week we're celebrating World Radio Day with a one hour special! Check out tracks from X Plastaz Mixtape - Shule - and a whole load of interviews!